Sign up for future All Star Health deals and coupons! Click the button below to sign up for future All Star Health deals, news, and coupons! $1.50 This is a Buy 1 Get 1 FREE offer! 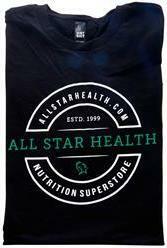 T-Shirt Description from ALL STAR HEALTH Large Black T-shirt with Blue and Gray AllStarHealth.com logo on front and back.